Margaret Roach did what many of us wish we could do ourselves. 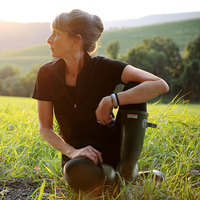 She left a high-powered job for a more authentic life in the garden. Although Margaret was “living the dream” as the Executive Vice-President and Editorial Director of Martha Stewart Living, she knew that due to her busy, high-power schedule, she was also missing her connections to nature and the garden that she loved. Luckily for us, Margaret took the leap and traded in her high heels for gardening boots. Now we are all benefiting from that transition. Today, Margaret is a leading garden author with several books including her latest, The Backyard Parables: Lessons on Gardening, and Life . But she is also a virtual mentor to thousands of adoring fans who read her award-winning garden blog: A Way to Garden. It is here that she shares her garden wisdom, sustainable garden tips, interviews with the top experts and even a vegetarian recipe or two. Margaret’s garden is one of the most well designed gardens we have ever filmed. So in this episode, Margaret and Joe take us on a tour to break down some of the design elements into teachable moments. They cover everything from garden design 101 to using color to trick the eye. They also discuss using grasses as a design element and how to work in harmony with nature. Then Joe looks at how Margaret composts using the windrow method. Later, Chef Nathan whips up a delicious Green Bean and Tuna Salad with a Dijon Mustard Vinaigrette. When Joe first mentioned that the show would feature a woman who left the corporate world and became a gardener, I thought of Karol Emmerich. She left the corporate world as well, and is now a noted daylily hybridizer. I found the parallels in the lives of the two women to be very interesting. Thank you for the chance to win this book. I do enjoy your program every Sunday. Thanks again and God’s blessings. I would truly enjoy her book. Hope I am picked. Hope I win the book – sounds like she lives a fascinating life! Margaret is an inspiring gardener. Love your show! Hello Joe! Long time no see. Well you just keep getting better! Margaret Roach is such an inspiration. I was lucky to get a glimpse of her at a garden club. I so love her message and methods not to mention courage. Love all your work and hope you have north NJ on your agenda again. What a lovely lady sharing her gardening interests and skills with everyone! I can’t think of a greater gift, I enjoyed her gardens very much so! Been reading GGWTV and Ms. Roach’s sites for some time now, and enjoy both. I already have Ms. Roach’s books and follow her blog. Growing a Greener World is one of my favorite shows ever-inspirational and informative. I’ve always dumped my garden debris on the edge of a wooded area and only learned from this episode that it has a name! I have other piles of horse manure, spoiled hay, and leaves, and a bin closer to the house for composting, so I’ve never actually re used any of the windrow in my gardening. Is there a downside to leaving it there permanently? Thanks Carolyn for loving our show! We appreciate that so much. And fear not about leaving your windrow where it is. It’s all good! Thank you for a wonderful show, exciting topics, delicious recipes and sharing great knowledge! I saw Joe Lamp’l speak last year, which eventually led me here. Enjoying it all very much, thank you. Great show! All of your shows are interesting and I always learn something new. Loved the show on Margaret’s garden. All of your shows are interesting and I always learn something new. what a great combo, Growing a Greener World and Margaret Roach – both so inspirational ! 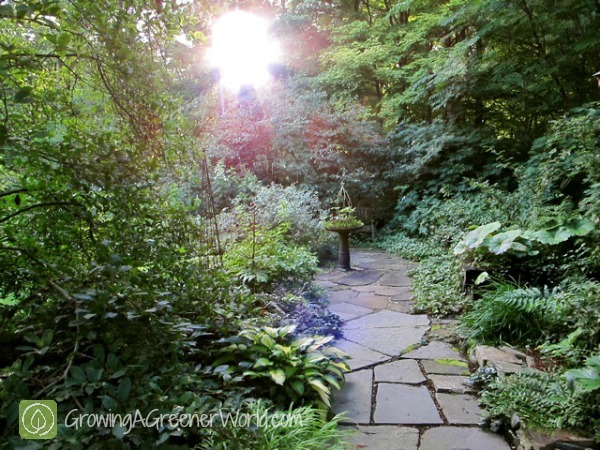 Grateful for a greene world ‘s sharing margaret roach’s inspirational and beautiful garden – images and feelings of awe happily continue to resonate in my visual & emotional memory! I wish I knew you were in upstate NY. . You , Margaret Roach and her garden are inspirational. I started my veggie garden 12 yrs. ago to be around my children more, basing most of what I did on your work starting with fresh from the garden. Growing organic veggies is time consuming but well worth it. Thank you. Friends of mine have a flower farm here in upstate NY, they are my other resource and worth checking out next time your up this way in Orange county . Very cool to hear that Mike. Sorry I was remiss in not getting the word out in advance as to our shooting schedule. We talk about trying to do a better job of that all the time, but one more thing to do and remember…ugh! It’s nice to hear from an old Fresh From the Garden fan. Stay in touch. I’m going to be reincorporating a lot more of that information, in a truly organic gardening way starting next season. Thanks for then info on your contacts and for writing. Great episode! GGW is my favorite show – the only show that I mark as “keep” on my DVR so they don’t get accidentally deleted. Thanks for all that you guys do for us. And I’m marking this nice comment of yours as “keep” as well. Thanks for the ultimate complement Charles. I retired 3 years ago and I am enjoying gardening so much.Organic gardening is what I am trying to do as much as I could, vegetables where the best this year.Margaret”s video was enjoyable . I feel the connectedness Margaret speaks of from being in my garden. For years, I subscribed to MSL and not knowing it was her, enjoyed her articles. Wish I could afford to quit my job to do this. Wow! Dare to Dream and thank you for introducing me to Margaret Roach. I’m so inspired. This program was wonderful! Encouraged and confirmed my thoughts to not wait until….just do it–do what you are destined to do. Thank you Margaret ! Great show! I saw it on Create TV. Thanks for introducing me to Margaret Roach! I’m now following her also! I found the winrowing approach to composting really interesting and plan to try that at my own place. I wasn’t getting the weekly turning done with the other method and this seems very natural and doable! Keep up the good work!!! Thanks Tamara. It is indeed liberating to see you can have awesome compost without stressing with the details. Margaret is certainly proof of that. Compost happens with or without our help. Thanks Mike. I agree. I love reading because you have to visualize what is being described. How fun it is to actually then get to see if for real, much like reading a book and then going to see the movie. And as far as catching up on our series, you will indeed be busy for a while. It covers over four years of work and time on the road, with currently 78 original episodes complete through season four with the final episode 426 of this year hitting the airwaves and online the last week of the year. That ought to keep you busy for a while indeed. Thanks for taking the time to write. I really enjoyed Margaret’s garden. I think the tip that viewing your garden from inside your house is an important feature for my design. Thanks for sharing and I hope I win the book! Wow, Joe! I just read your beautifully written piece on “Behind the scenes look at filming Margaret Roach”. And I just found Growing a Greener World through Margaret’s Facebook page. Now I’m catching up on past episodes and just loving it. Thank you for sharing your passion! And thank you Mary for taking the time to write and share your kind words. So glad you found us and look forward to hearing from you again. I think we’ll be able to keep your pretty busy catching up on all our past episodes (currently 78 complete through season 4). We’ll keep producing more. Comments like yours are so motivating to us. Thanks again! Excellent episode. Since I found your show on the terrific Create channel, I’ve been hooked. Always something to learn and this show with Margaret was especially informative. My partner and I someday hope to have a home and garden like Margaret’s. Just super! Hi Tom. Love that we’ve hooked you. We try very hard to make every episode entertaining and informative and I do think this episode with Margaret did that in spades. She’s terrific and her garden paradise. Glad you were able to find inspiration as you strive for that yourselves. Thanks for taking the time to right and share your kind words. Thanks for the opportunity for another book to read. I do enjoy the show especially since you moved further down south, Not many informative shows left. This looks like a must have gardening book. I am looking forward to reading it. Love the show! Keep up the great work! Thanks Will. We plan on being around a long time! Digging in the dirt is the best therapy in the world, if I couldn’t get my hands dirty once in a while I would feel unfulfilled..
I’ve been a fan of her for quite a while. Great show! We, humans, are more plant-like than we believe. We even discuss having “roots” and are upset when forced to “uproot and relocate”. We need regular feeding and watering, and our bodies exchange gases from and into the atmosphere. And like Hiawatha, we fertilize the next generation. Love, Love, Love your shows. Always informative but done with inspiration… and humor! Thanks Lori. We know you mean it when you include “love” 3X. That’s what I do when REALLY mean it too. And glad you appreciate the humor too. Hope we keep you learning and laughing. Beautiful garden, beautiful show. Thanks for sharing your garden Margaret. I would love to have a copy of your book. I’m sure it was a difficult decision to leave Martha Stewart, but what joys and beauty she has reaped. I must check her book. Thank you! So happy that more people are finding you guys! You all work so hard and give so much. 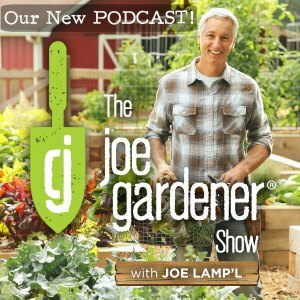 The best garden education show of all times! We LOVE you guys so much! Happiness and success for the new years episodes coming soon. Thank you Ruth! We love you too. We sooo appreciate your generous words of praise and motivates us more than you know. I read Margaret’s first book and have been a fan ever since! I am an avid follower and especially like readings her posts in the winter when our beds have been put to sleep. Readings and dreaming of my summer garden get me through these long Michigan winters. Thank you, Margaret! Wonderful show. I can’t wait to get my hands dirty in my garden today. Thank you for the inspiration! As a retired former Corp Exec myself Margret’s approach is very inspiring. I love to take elements from her gardens for my own. Loved the episode. I actually look forward to Margrets podcast every week like one would a tv show. It was wonderful to see the gardens she’s always speaking of! I love gardening but my design definitely needs some help! I am always looking for inspiration and with us hopefully buying a house (small farm?) soon, I have been gathering resources so I can be prepared to dig right in. Margaret Roach’s book is definitely going on my wishlist. Loved the show and would love the book! Great show! Thanks! I watch every Saturday morning, and I really appreciate the ideas – both gardening and cooking. Great to hear Stan! Thanks for being a loyal fan. We’re already working on the new lineup for season 5 with the promise we’ll keep the good ideas, both gardening and cooking, coming. Very empowering and inspirational episode! Thanks for letting us know about this Eric and for your nice comments about the shows. Please let us know the station that was airing GGW and we’ll inquire about this. But, it is always best if the viewer calls to make their feelings known. You are their audience and you are who they really listen to. As the producers of the show, we don’t carry as much weight as you in this case. Please let us know what you find out and we’ll do the same. Just let us know the station. Also, thanks for the suggestion about crafts being incorporated into episodes. Great idea! Thank you for sharing you peaceful woodland garden. It is truly an inspiration to me. Hey GGW! Love Ms. Roach’s blog and of course your show! Thanks Carmen. Always great to hear that. Appreciate you taking the time to let us know. Would love to make enough compost for my gardens – beautiful gardens!! I love the gardens. Beautiful! What a beautiful garden! i hope I can get my yard in a more beautiful and inspiring space. Thank you for the excellent interview & the sharing your visit to Margaret’s beautiful sanctuary! It was a joy to watch. You’re welcome Surya, and thanks for writing to share your kind words. We love comments like this! Lovely yard and gardens. Loved the show. Excellent camera work and narration Joe. Keep up the good work. I also wish Ms Roach much success on her latest book. Thanks James. We have another good season of shows in the works for season 5. Margaret’s books are doing very well. I’m currently reading her Garden Parables book for a second time. I loved it the first time and now, having been there, its fun to be able to visualize all the things she mentions. I retired last year from management and creating my Eden in Paradise, yes, Paradise, Ca. 95969 and would love to read Margaret’s books. Her yard is a lot like what I’m creating here in our little “town in a forest” here in Paradise. My husband and I think yours is the very best garden show we’ve ever seen Thank you all. Thanks Sandra for the very nice comment about our show! We are presently building our own house and already planning the design of our landscaping and extensive gardens. Showing off Margaret’s acreage is a great form of inspiration and I can’t wait to try her suggestions and follow her lead! Joe, you said to add something to water areas to keep mosquitoes down, but I didn’t get that. Can you let me know what you said? I live in Florida aka mosquito haven! Thanks. Hi Carol. It is a product that contains a harmless bacteria (except to mosquito larvae). The short reference for the active ingredient is B.t and they are sold in stores and online commonly as “mosquito dunks”. They’re a good option for placing into still ponds and water features and and in standing water. It’s the best and most benign option I know of. I would love a copy of the book. I love Margaret!! I would love to receive a copy of Margaret’s book. I am living in southern Utah, not easy to garden here but I belive in her principles – nothing but good compost. Thank you Joe for such good programs. Well done. Thank you and Happy Holidays. I saw your tv program GGW for the first time on PBS last weekend and absolutely loved it. Look forward to seeing other episodes. I also enjoyed watching about Margaret Roach garden on my iPad today. I have lots of land and would love that style of garden for it! I just don’t know where to start. I’ll have to get one of her books for sure.. Thanks from south Louisiana. So glad you found us Melissa. We love hearing from new viewers that discover us and take the time to write and tell us how much they enjoyed our episode. We’re busy working on more episodes for our 5th season. Hope you’ll stick around to catch up on all the past episodes too. Thanks for writing. I really like this program, it is of interest tome as far as gardening and cooking episodes. The program with Margaret Roach reminds us what is truly the point in gardening and that is to support nature, find your personal peace, and enjoy the harvest. She was straightforward with her information and I loved it. Having visited Margaret’s garden this summer during GC’s Open Days, made this program even more enjoyable. You both are doing a wonderful service for the gardening world and also making this world a better place. I love your sight, and have been a fan of Margaret’s for along time. Really enjoyed seeing her garden. Great job filming. What a great episode! I watched it AFTER listening to the podcast-double pleasure. It’s amazing to see what Margaret has been able to do with such as small piece of property. I particularly loved the area of grasses that she showed us-an interesting idea regarding how to leave natural places where native grasses can grow and still look lovely. You mentioned the compost disaster. Are the boxed gardens that appeared in today’s blog (11/15) the very same gardens that you discussed on the podcast? Thanks for sharing this “faux pas,” and for sharing how you overcame it and moved on. This is all part of gardening! Thanks Laurie for you comments. And yes, the garden you see in pictures now, IS that garden. Some plants are more sensitive to the herbicide than others, so part of what you see is the fact that some plants are not affected. Yet I can report that I did have success with my most affected plants, tomatoes, in a second round of plants late in the season. When they finally gave in to frost, they were looking very healthy and showed far less symptoms then the first crops. I attribute that to the diligence of working the soil by turning it often to expose it to air and sunlight, and planting cover crops. Keeping the soil active I think is making a very big difference! I just found your show recently on our NH PBS station at 6pm. I look forward to each episode. This particular episode with Margaret Roach’s garden was particularly inspiring. I tend to “over-flower” in a haphazard sort of way. Grasses and plants with lovely foliage are forthcoming — what a lovely thing to think about and to plan during a long NH winter. Excellent Kate. So love hearing this and so appreciate loyal viewers like you. It certainly inspires us to keep striving to bring more excellent topics and guests. Thanks for taking a moment to let us know. It means a lot! I loved everything about your show. And I especially enjoyed Margaret as a guest. I have been following her since she was with MS Living. Thank you, Thank you, Thank you. Three Thank you’s to you too Carol! Love the show. I read Margaret’s blog and so enjoyed seeing her in person. As always good information and inspiration. nice show!! !-love joe ‘s “shows”-love your garden info Margaret.can’t get enough of it!!! Thanks Lou! You’ll be happy to know, we have new episodes that will continue until the last Saturday in December. Then,or anytime, you can watch all 78 (from the first 4 seasons) online. We’ll be starting production for season 5 early next year with new episodes premiering on air and online in early July, 2014. Joe is ALL over the place, a couple of tv shows, newspapers, etc. And I always enjoy him. As a fan of his and Margarets’ I loved this show. LOL Roger. Yes, we do get around. It’s exhausting but exhilarating at the same time. I’m sure we run on adrenaline most of the time! Thank you for taking the time to write and share your kind words of support. “That’s” what really keep us going. I have been listening to Margaret’s podcast “A Way to Garden” for about a year and it is great to see her and Jack in her beautiful garden. What a delight! 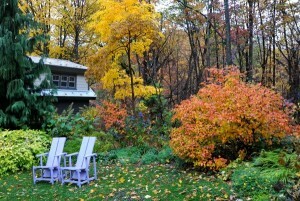 A feast for the eyes with inspirations to make it thru winter while the garden “sleeps”. Thanks for the visual treat for my November eyes! Nice show. Made me think about color in the yard. and the salad segment made me decide to make lunch soon. What a great garden! I love the win row method of compost making. One thing I’d have difficulty doing is sitting still long enough without seeing something else that needed to be done. Relaxing would take discipline.